A really short post today, about something I really love. I love beef. I really do. I don't get to eat beef much here since it's really expensive, but once in a while it's worth splurging for. And this was most definitely worth splurging for. The best thing is that this place is right in Jaya Grocer itself. Why is that good, you might ask? What you do, is you go to the butcher (or fishmonger if you're into seafood), get what you want, bring it to the restaurant counter and pay RM6 for them to cook it for you and give you a side (salad, cooked vegetables or pasta). Simple as that. 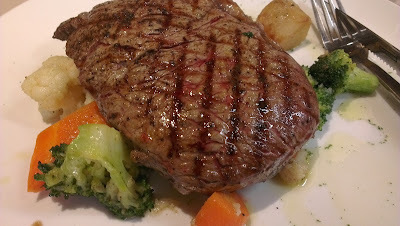 That massive steak which would have cost me easily RM120 elsewhere only hit me for RM38 or so. Incredible value. They do other Italian classics as well, such as wood-fired pizzas and a really good wild mushroom soup. Highly recommended. After many moons, another food review! This time it's Fa-Ying, at Paradigm Mall. Fa-Ying is actually located on the Boulevard part of the mall, which is actually outside and offers some alfresco dining options (which I dislike in this tropical heat) although there still is an indoor air-conditioned section. I'm not the kind to whip out my camera and snap away at anything and everything, so I apologize for the lack of pictures at the moment. 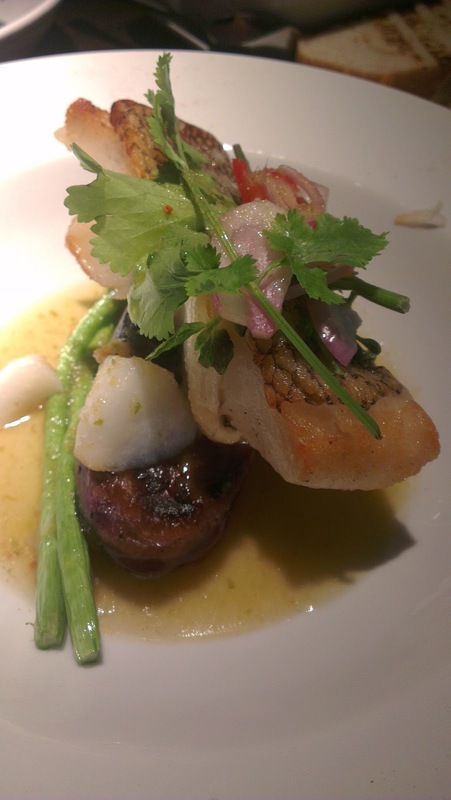 Anyway, Fa-Ying was opened by the good people at Rama V, an upscale Thai restaurant in downtown KL. However, Fa-Ying serves more of fusion or modern Thai, although they do have some traditional Thai favorites. Enough chatter, let's get on to the food. First up, Belacan Fried Rice. This was tasty with marinated stir-fried chicken, fried egg strips, cucumber strips, dried shrimp, onions and birds-eye chilies that you can mix into the rice that was fried with squid. About RM20 if I'm not mistaken, it was good but I feel it was slightly overpriced. 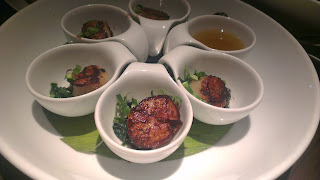 Seared scallops with spinach and manow sauce was good, it was under a section of the menu called Thai Tapas. You make your own conclusion from that. The scallops were a bit on the small side but tasted decent. Anyone who knows me well knows that I love scallops. Lemme say that again. I LOVE SCALLOPS. 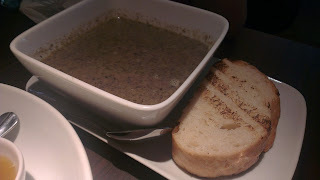 Mushroom soup is one of the things that make this place fusion-y, like I mentioned earlier. Nothing to shout about, this was ordered for a child at the table so she wouldn't have to suffer with the spiciness of the tom yam soup. Cod with manow sauce tasted quite decent, but at RM42 was a bit of a luxury item. The piece of cod was actually a bit bigger than it looks in this picture, and it came with some asparagus, grilled eggplant and peppers. It tasted pretty good, the fish was grilled well with a slightly crispy exterior and skin, while the insides were moist and juicy. Lemongrass Creme Brulee turned out very average. 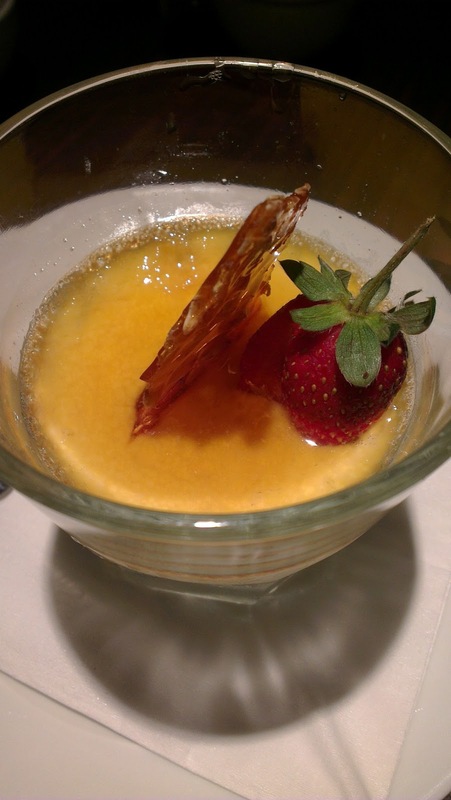 The strawberry and peanut brittle was a nice touch, but although the creme brulee tasted okay, they neglected to caramelize the top with a blowtorch or in the oven, which would have elevated this dessert to a much higher level. I didn't manage to take photos of all the food as some of it went to the other end of the table since we were there in a group. We had pomelo salad with prawns (very good and tasty), lamb satay (tasty and juicy), vegetarian satay (which turned out to be a few triangles of fried tofu with some satay sauce), tom yam soup (decent and not too spicy) and vegetarian green curry (which came with rice, the green curry is a goodly portion and was as good as any good green curry you can find). Overall, Fa-Ying is a decent place with good food, although prices prohibit it from becoming a regular hangout place unless you're rolling in the cash. They do have set lunches at the moment for RM10+, although there's only one menu item for set lunch on any given day. The bill for 6 (+1 child) adults came up to about RM370, not cheap for what we had, but an acceptable price for a special occasion. Service was a bit strange, some of the newer servers can get confused (we ordered a Caesar salad with fried catfish which never came, and thankfully didn't show up in the bill, and they were confused with some of the drinks), but the manager was very good and helpful. Drinks: 7/10 - a decent selection, unfortunately, they were out of a lot of things, including fresh coconut. 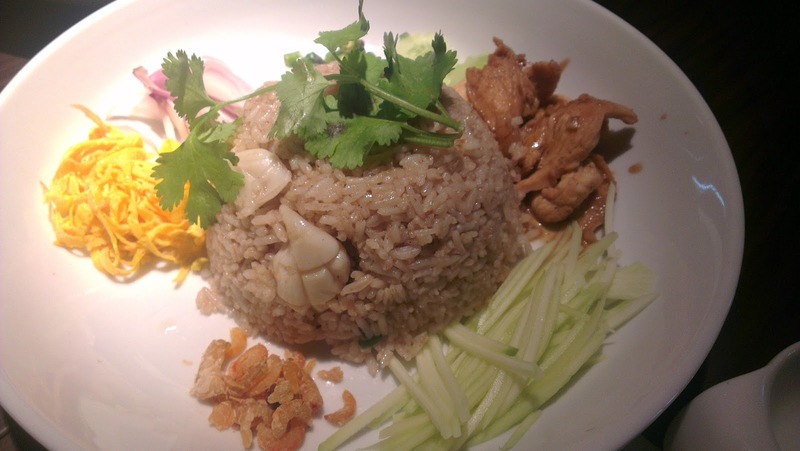 How can you have a Thai restaurant experience without coconuts? Value: 4/10 - expensive for what you get, but it does taste good so at least it's not wasted calories.